Have the best of both worlds at this Cabo all-inclusive resort! The rugged seclusion of Baja’s pristine East Cape on the sparkling turquoise Sea of Cortez, combined with world-class service, striking Mexican architecture, and top drawer amenities. Discover all adult, all-inclusive Secrets Puerto Los Cabos Golf & Spa Resort, with its Unlimited-Luxury commitment to exceeding expectations and granting every wish! Indulge in an expansive array of local and international cuisine by Secrets’ talented chefs. Choose from buffet, grill or café, plus five á la carte gourmet restaurants; or sneak away for a romantic meal in your suite or on the beach. Secrets’ Unlimited-Luxury privileges include all meals as well as top-shelf spirits. Nestled beachfront in the exclusive community of Puerto Los Cabos, with its award-winning golf course, and adjacent to San Jose’s world class marina; ensures Secrets’ guests easy access to all kinds of entertaining activities and sight-seeing. A short drive to the sweet Mexican fishing village of San Jose del Cabo with its relaxed atmosphere, quaint shops, and historic Art District will satisfy your cultural and shopping urges. Whether it’s golfing, fishing, exploring Baja’s endless beaches, lazing by the pool working on your suntan, or being pampered by talented spa technicians; the ultimate secret to escaping life’s responsibilities, is Secrets Puerto Los Cabos. 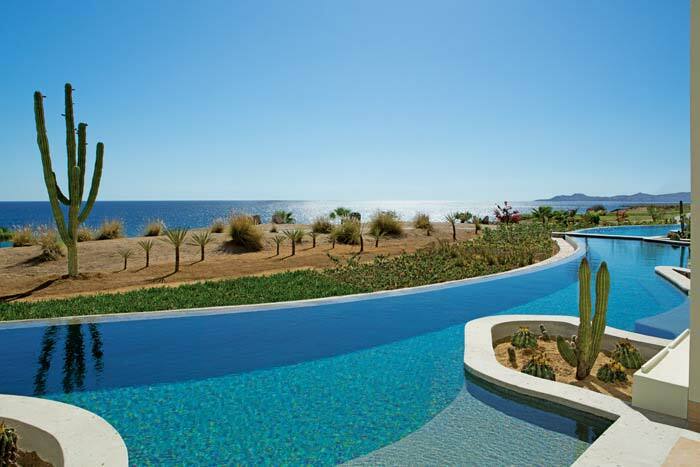 Secrets Resort is located in Puerto Los Cabos which has been compared to the Hamptons of Los Cabos. It is very quiet, relaxing, intimate and private. Should you have the desire to get off property to discover the culture and fun of the Baja, you need to know this spectacular hotel resort is about a 15 minute drive to downtown San Jose del Cabo; and 45 minute drive from Cabo San Lucas. Ask your LuxLife Vacations Concierge where to connect with the best activities to fit your travel style, appetite and budget. Secrets Resort is Adults Only and All-inclusive with an impressive Premium meal plan included. With 8 onsite restaurants to choose from (5 of them fine dining options) you will find that every dining experience is beautiful and unique. Dinner reservations are never required. Baja blue skies, turquoise sea, and a warm terracotta and sand palette await you in your garden view Junior Suite. Wake up to incredible sunrises, or relax at day’s end with a starlit dinner on your private terrace, overlooking the desert scape gardens and spectacular Sea of Cortez. Enjoy Baja’s unique indoor/outdoor lifestyle at its best! This oversized room is furnished with a king or two queen beds and a comfortable seating area. Full bath includes shower and hydro-tub to rinse off the sand and salt of the day. 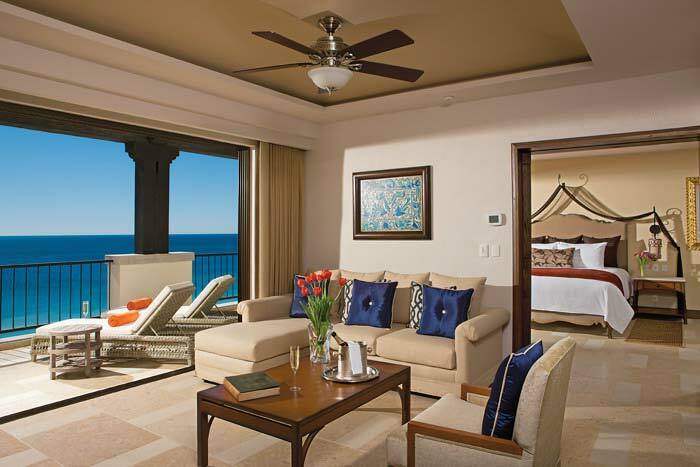 Baja blue skies, turquoise sea, and a warm terracotta and sand palette await you in your Ocean view Junior Suite. Wake up to incredible sunrises, or relax at day’s end with a starlit dinner on your private terrace, overlooking the spectacular Sea of Cortez. Enjoy Baja’s unique indoor/outdoor lifestyle at its best! This oversized room is furnished with a king or two queen beds and a comfortable seating area. Full bath includes shower and hydro-tub to rinse off the sand and salt of the day. Baja blue skies, turquoise sea, and a warm terracotta and sand palette await you in your Swim out garden view Junior Suite. Wake up to incredible sunrises, or relax at day’s end with a starlit dinner on your private terrace, overlooking the desert scape gardens and spectacular Sea of Cortez. Enjoy Baja’s unique indoor/outdoor lifestyle at its best! This oversized room is furnished with a king or two queen beds and a comfortable seating area. Full bath includes shower and hydro-tub to rinse off the sand and salt of the day. Baja blue skies, turquoise sea, and a warm terracotta and sand palette await you in your Swim out Ocean view Junior Suite. Wake up to incredible sunrises, or relax at day’s end with a starlit dinner on your private terrace, overlooking the spectacular Sea of Cortez. Enjoy Baja’s unique indoor/outdoor lifestyle at its best! This oversized room is furnished with a king or two queen beds and a comfortable seating area. Full bath includes shower and hydro-tub to rinse off the sand and salt of the day. Baja blue skies, turquoise sea, and a warm terracotta and sand palette await you in your Preferred Club Junior Suite with Ocean View. Wake up to incredible sunrises, or relax at day’s end with a starlit dinner on your private terrace, overlooking the spectacular Sea of Cortez. Enjoy Baja’s unique indoor/outdoor lifestyle at its best! This oversized room is furnished with a king or two queen beds and a comfortable seating area. Full bath includes shower and hydro-tub to rinse off the sand and salt of the day. Baja blue skies, turquoise sea, and a warm terracotta and sand palette await you in your Preferred Club Ocean Front Junior Suite. Wake up to incredible sunrises, or relax at day’s end with a starlit dinner on your private terrace, overlooking the spectacular Sea of Cortez. Enjoy Baja’s unique indoor/outdoor lifestyle at its best! This oversized room is furnished with a king or two queen beds and a comfortable seating area. Full bath includes shower and hydro-tub to rinse off the sand and salt of the day. Baja blue skies, turquoise sea, and a warm terracotta and sand palette await you in your Preferred Club Junior Suite Swim Out with Ocean View. Wake up to incredible sunrises, or relax at day’s end with a starlit dinner on your private terrace, overlooking the spectacular Sea of Cortez. Enjoy Baja’s unique indoor/outdoor lifestyle at its best! This oversized room is furnished with a king or two queen beds and a comfortable seating area. Full bath includes shower and hydro-tub to rinse off the sand and salt of the day. Baja blue skies, turquoise sea, and a warm terracotta and sand palette await you in your Preferred Club Ocean Front Swim Out Junior Suite. Wake up to incredible sunrises, or relax at day’s end with a starlit dinner on your private terrace, overlooking the spectacular Sea of Cortez. Enjoy Baja’s unique indoor/outdoor lifestyle at its best! This oversized room is furnished with a king or two queen beds and a comfortable seating area. Full bath includes shower and hydro-tub to rinse off the sand and salt of the day. 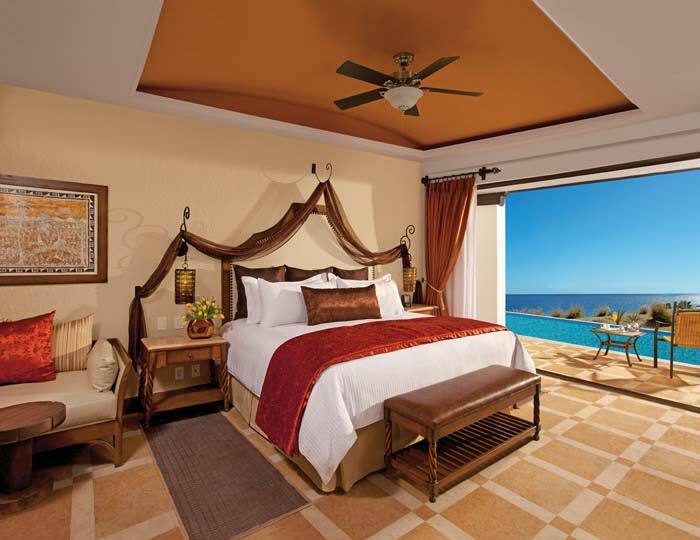 Baja blue skies, turquoise sea, and a warm terracotta and sand palette await you in your Master Suite with Ocean View. Wake up to incredible sunrises, or relax at day’s end with a starlit dinner on your private terrace, overlooking the spectacular Sea of Cortez. Enjoy Baja’s unique indoor/outdoor lifestyle at its best! This oversized room has a comfortable seating area, as well as a separate bedroom furnished with king bed. Full bath includes shower and hydro-tub to rinse off the sand and salt of the day. Baja blue skies, turquoise sea, and a warm terracotta and sand palette await you in your Swim out Master Suite with Ocean View. Wake up to incredible sunrises, or relax at day’s end with a starlit dinner on your private terrace, overlooking the spectacular Sea of Cortez. Enjoy Baja’s unique indoor/outdoor lifestyle at its best! This oversized room has a comfortable seating area, as well as a separate bedroom furnished with king bed. Full bath includes shower and hydro-tub to rinse off the sand and salt of the day. 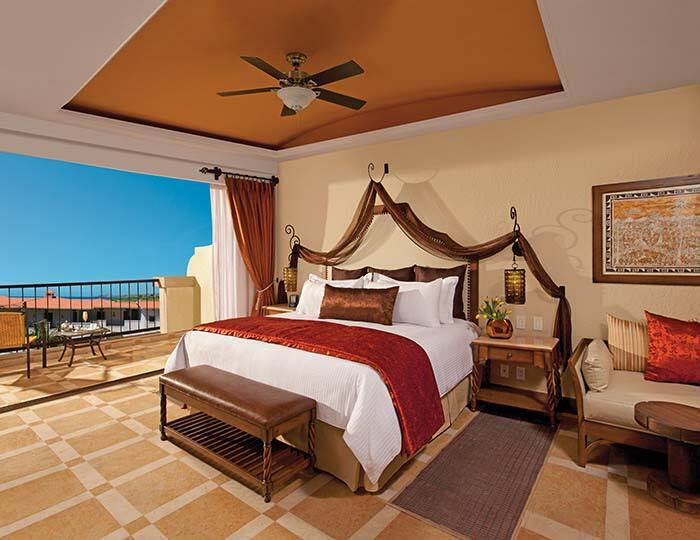 Baja blue skies, turquoise sea, and a warm terracotta and sand palette await you in your Ocean Front Master Suite. Wake up to incredible sunrises, or relax at day’s end with a starlit dinner on your private terrace, overlooking the spectacular Sea of Cortez. Enjoy Baja’s unique indoor/outdoor lifestyle at its best! This oversized room has a comfortable seating area, as well as a separate bedroom furnished with king bed. Full bath includes shower and hydro-tub to rinse off the sand and salt of the day. Baja blue skies, turquoise sea, and a warm terracotta and sand palette await you in your Swim out Ocean Front Master Suite. Wake up to incredible sunrises, or relax at day’s end with a starlit dinner on your private terrace, overlooking the spectacular Sea of Cortez. Enjoy Baja’s unique indoor/outdoor lifestyle at its best! This oversized room has a comfortable seating area, as well as a separate bedroom furnished with king bed. Full bath includes shower and hydro-tub to rinse off the sand and salt of the day. Baja blue skies, turquoise sea, and a warm terracotta and sand palette await you in Secrets’ Ocean Front Presidential Suite. Wake up to incredible sunrises, or relax in your Jacuzzi at day’s end on your private terrace, overlooking the spectacular Sea of Cortez. Or enjoy in suite service with a gourmet dinner under the stars. Experience Baja’s unique indoor/outdoor lifestyle at its best! This oversized room has comfortable seating and dining areas, kitchenette, and 55″ TV, as well as a separate bedroom furnished with king bed and walk-in closet. Full bath includes shower and hydro-tub to rinse off the sand and salt of the day. Baja blue skies, turquoise sea, and a warm terracotta and sand palette await you in Secrets’ Swim out Presidential Suite. Wake up to incredible sunrises, or enjoy in suite service with a gourmet dinner under the stars on your private terrace with direct swim out to pool, overlooking the spectacular Sea of Cortez. Experience Baja’s unique indoor/outdoor lifestyle at its best! This oversized room has comfortable seating and dining areas, kitchenette, and 55″ TV, as well as a separate bedroom furnished with king bed and walk-in closet. Full bath includes shower and hydro-tub to rinse off the sand and salt of the day. Secrets Puerto los Cabos is located beachfront on the Sea of Cortez, just inside the gates of the exclusive Puerto Los Cabos community, close to the Marina and all the activities and eateries in the growingly popular La Playita fishing village. Situated between San Jose del Cabo’s famed Estuary, and Puerto Los Cabos Golf Courses, just a few minutes drive from world famous Flora Farms and Acre Organic farm-to-table restaurants. It’s also just a few minutes drive across the bridge to the quaint town of San Jose del Cabo, with its array of casual and fine dining, and shopping in El Centro square, and the Historic Art District. Secrets is a world away from the nightlife and hubbub of Cabo San Lucas, but only a 45 minute drive to Land’s End if you choose to explore! “The old saying “No shoes, no shirt, no service” applies at this elegant resort. Secrets features a “casually elegant” dress code. Ladies must wear a coverup over bathing suits, and men must wear shirts with sleeves to all restaurants. Treat yourself to some serious Secrets pampering at the impressive Pevonia Spa. Choose from dozens of pampering options to refresh, recharge and rejuvenate you on your dream vacation. Experience pure indulgence through a combination of the latest hydrotherapy and indigenous treatments, with a seaweed wrap, Swedish massage, or Secret’s special facial treatment. Secrets Puerto Los Cabos Golf & Spa Resort is a golfer’s paradise. The challenging pair of adjacent Nicklaus and Norman designed courses will keep you on your toes, as you take in breathtaking views of the Sea of Cortez, and Baja’s incredible desert vistas. After your day on the links you can have all your kinks massaged out at the spa, soak in the hot-tub or swim, and have a great dinner in your suite, on the terrace or in one of Secret’s outstanding restaurants. This adults only, all-inclusive Resort & Spa offers a delicious combination of relaxation, pampering, visual and culinary delights. From working out in the state-of-the-art workout facilities to lounging at the swim-up bar, first-class amenities for all guests.